Daniel Wellington has gained a global popularity and are purchased on all corners of the world. It is a very popular watch brand. So today we write an article about Daniel Wellington watch reviews. There are three specific pieces of Daniel Wellington mens watch and two Daniel Wellington womens watch are going to be reviewed, with the principal focus on making you have a concrete knowledge about them so that you may be able to make an informed choice when purchasing one. Are daniel wellington watches good? You will find the answer yourself in this Daniel Wellington watch reviews article. The history of Daniel Wellington watch is quite funny but again interesting. It all began when Filip Tysander, the founder, met a wanderer as he was backpacking via Australia in 2006. During this period, the adventurer by the name of Daniel Wellington, had a minimalist gray and black nylon band, known as a NATO strap. After a few encounters with Wellington, Filip Tysander became obsessed with the colorful straps and the different leather options displayed by the accessory. Filip Tysander went back home in Sweden, and founded a whole company based on the idea, naming it after the stranger who had inspired him. Daniel Wellington makes watches that are slim, minimalistic, traditional and elegantly refined. They come with rose-gold-colored or polished steel cases and in five sizes ranging from a miniature 26-mm to a medium-large 40-mm. The obvious thing that differentiates these watches is the strap, which comes in a six colorful nylons and few leather options. Below are five Daniel Wellington watch reviews as well as the individual ratings, here we go. Pros: 1. An affordable piece but elegant and stylish. 2. Good looking, light weighted. 3. Italian leather band seems nice and can not fade out easily. 4. Never lose time because of Quartz movement. 5. Water resistant to 30 m (99 ft). Cons: 1. Do not show date. 2. Water resistant but not waterproof. Not suitable for swimming. Daniel Wellington Men’s 0106DW is meant for men and perfect for a casual style. It has a brown leather strap, and a rose gold-tone stainless steel case that nicely complements its white face. The dial has a clean and a classic design. It allows you to focus on the movement of the hands via the protective glass lens. The round case is only forty millimeters in diameter, while the thickness is six millimeters. So it is not too heavy regarding portability. If you are that individual who craves for beauty, the use of rose gold on the buckle and the dial have got you covered. And they complement the dark brown leather strap beautifully. When choosing a man’s watch, the most important things to consider apart from the features are the timelessness and durability. Daniel Wellington Men’s 0106DW Watch offers a high-quality performance. It has the quartz movement at its disposal. So as a user, you don’t need to worry about this perfect timepiece device losing or gaining time. For durability and strength, the stainless steel case gives it the ability to withstand a few knocks without suffering any significant damages. There are numerous model and brands of mens watches out there in the market every year. 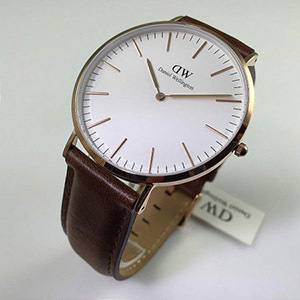 But arguably none of them matches the magic of the Daniel Wellington Men’s 0106DW Watch in our opinion. The design is perfect and also water resistant. (In general, withstands splashes or brief immersion in water, but not suitable for swimming). It is the watch offers maximum performance but has a very affordable price, we are sure it is worth considering for a buy. Pros: 1. It is an affordable piece which evokes class and elegance. 2. The strap is simple yet classy, and can be replaced very easily. 3. It is extremely lightweight and goes with every type of outfit. 4. Completely water resistant up to 30 meters/99 ft. of depth. Cons: 1. The middle white part of the strap stains easily and is difficult to wash off. 2. It does not show the date. 3. Water resistant but not waterproof. 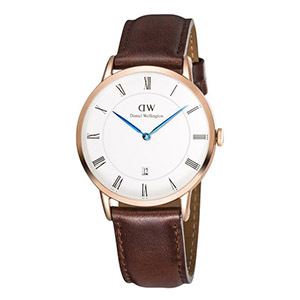 Daniel Wellington Men’s 0103DW Watch, which is inspired from the Classic Cambridge design, is worthy of its price. It possesses a quartz movement with an analog display. 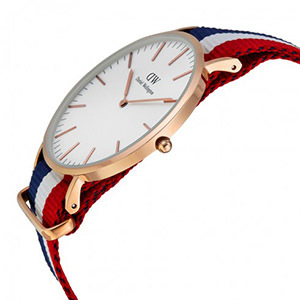 Speaking of class and sophistication, Daniel Wellington Men’s 0103DW watch combines a white, round dial with a red, white and blue nylon strap. It carries itself in a round, rose-gold stainless steel case which is 40 mm wide and 7 mm thick. The dial displays the minute markers around the outer rim with index hour markers. And it has a scratch resistant mineral for the covering of the watch dial. The display hands are toned in rose-gold too, which complement the outer case. 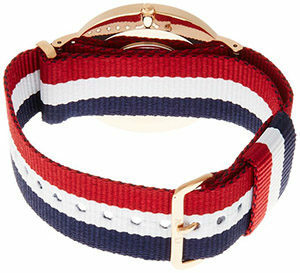 Its band being 20 mm wide is a combination of red, white and blue NATO nylon and consists of a buckle closure. The versatility of the colors in this watch come together to form a unique piece. Being super light and water resistant up to 30 meters of depth, this watch is extremely stylish and affordable too. The combination of rose-gold, stainless steel and the band produces a piece that looks good with casual as well as formal attire. Its unique feature of measuring seconds is surely not necessary but it adds to a nice touch. The features of this watch are not overbearing and showcase an impression in itself. This simple, elegant and versatile watch is one piece which you need to add to your wardrobe because of its looks and affordability. Pros: 1. Extremely elegant and stylish. 3. The band can be adjusted according to needs. 4. It shows the date. Cons: 1. Not suitable for men with larger wrists. 2. Water resistant but not waterproof. 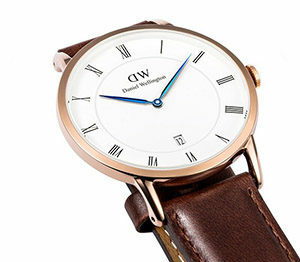 Daniel Wellington Men’s Dapper watch comprises of looks and needs for the modern man. It can go with any type of attire and shouts out sophistication. This watch possesses a quartz movement and an analog display. It has a mineral glass dial window material and a round white colored display. The Roman fonts which represent the hours add to a classic touch to the overall composure. The blue hands of the dial highlight a decent pop which is a different feature than the otherwise gold or silver shaded hands. It is encompassed in a round stainless steel case which is 38 mm wide and 7 mm thick. 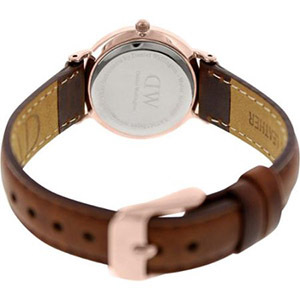 The exquisite and classic band comprises of a brown colored leather strap. It is 19 mm wide and consists of a buckle type clasp. It is also water resistant up to a depth of 3 meters. Daniel Wellington Men’s Dapper Watch speaks of a perfect balance of color and class through the assembly of the white dial, the rose gold case and the brown leather strap. The tiny arches which connect the case and the strap are the minute details. They simply add elegance to the watch. The little and minute details put together to make this watch sophisticated . It can be worn on any occasion and perfectly completes your formal ensemble. It embarks upon some playfulness with its different yet appealing blue hands. In conclusion, Daniel Wellington Men’s Dapper Watch is extremely durable, facing any type of bumps and obstacles and working just fine. It is definitely a piece of art to be possessed and an important addition to your wardrobe that simply screams of elegance and class. Pros: 1. Affordable price and nice design. 2. Small size but perfect for women’s wrists. 3. Very classic, expensive, and understated look. 4. Beautiful, dainty and feminine. Cons: 1. Do not display date. 2. Not waterproof. In general, withstands splashes or brief immersion in water. Women always have got an upper hand when it comes to selecting quality watches. Perhaps this is because women are more passionate about these devices. 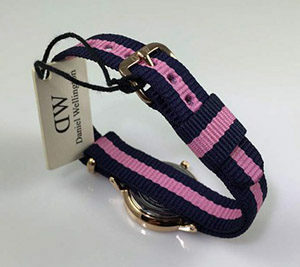 Daniel Wellington Women’s 0900DW boasts of attractive features and is a perfect fit for females. It features crystal indices and a white dial and rose gold hands. The brown beautiful leather strap comfortably wraps around your wrist with a buckle clasp. The flawless band, the slim dial, exclusive Swarovski crystals and elegant design, all make it a timepiece that defines classy feminity. 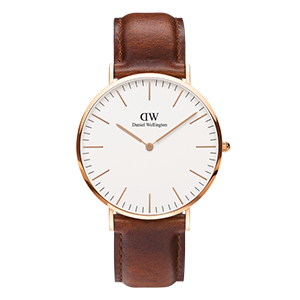 With a case size of twenty-six millimeters only, it is the most minimalistic watch by Daniel Wellington. It is extremely versatile, and can be worn for almost every occasion. Whether when you are playing a game, attending an informal or a formal event, or you are having a big time at the beach. It is just a perfect timepiece that you would lay your hands on. The unique and interchangeable straps provide some degree of convenience. And with this feature, you can display the particular strap that best suits your preference. Additionally, it is durable and has an average water resistant up to 30 m (99 ft). Even though water resistant, it is advisable that you avoid all contact with water. It is always paramount to consider the features of a particular watch. That includes: the case,the band materials, and functionality regarding movement type when purchasing watches. The Daniel Wellington Women’s 0900DW watch boasts of all the smartest features that a high quality watch would have. It has a quartz movement, is durable, and the band materials are top class. It is overall a complete device that anybody would love to have. 2. The size is small which is appropriate and perfect for women’s hands. 3. Simple, elegant and comfortable. Cons: 1. The nylon band ends get a bit fluffy after a while. 2. Way too tiny for some women. 3. It does not display the date. Particularly designed to emphasize a woman’s delicate wrist, Daniel Wellington Women’s 0906DW watch features a black and pink nylon strap with a rose gold case. It forms a perfect combination of attire with the white dial tying together the dual colored strap and the elegant rose gold case. 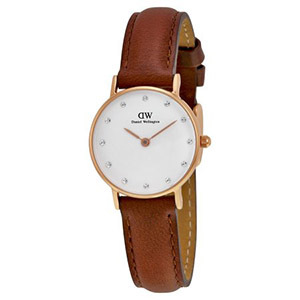 Daniel Wellington Women’s 0906DW watch speaks of sophistication and class with pure elegance. It possesses a quartz movement and is carried in a 26 mm wide and 6 mm thick rose gold stainless steel case. With its analog display, the dial also features rose gold hands with tiny Swarovski stone indexes that represent the hours. 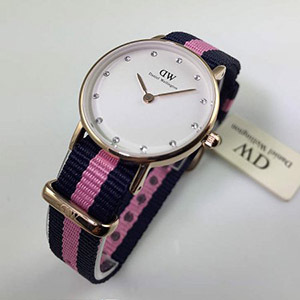 Daniel Wellington Women’s 0906DW has a pure white shaded dial that perfectly complements with the dual-toned strap,which is a 13 mm wide pink and black colored nylon strap. With a stainless steel bezel, it displays a uni-directional and analogue bezel function. This round and completely light watch is a manifesto for the fashion of women. It is stylish and speaks of elegance whenever you wear. The addition of the Swarovski crystals in the dial adds the overall stylish composure of the watch. It is water pressure resistant up to 30 meters of depth. One of the huge advantages of this watch lies in its interchangeable straps. It can be changed with a different style that perfectly suits your occasion and ensemble. There is no doubt this watch is ideal for women who are looking for a watch that perfectly suits their tiny wrist.